Easily considered one of the world’s most lovable little dogs, the Pomchi (don’t mistake it with Pomsky) has captured the hearts of pet owners across the globe! These feisty little pups owe their dashing good looks to the daring Chihuahua and the sassy Pomeranian—both of which are considered purebred toy breed dogs. Iconically known for their sassiness, sneakiness, and independent personality, the Pomchi is a dog that will undoubtedly be able to weaken the knees of any pet lover! Unsure if the Pomchi is the right dog for you? Then this article is just for you! Today, I will cover everything you need to know about the unique, cheerful Pomchi! Bathing, Grooming, and Brushing— Are Pomchis High Maintenance Dogs? All the Extra Little Bits—Dental, Ears & Nails! The Cunning, Daring Personality of the Pomchi! Will They Get Along With Other Pets? Should You Be Worried If You Have Kids? Pomeranian Chihuahua Mix is The Smallest Watchdogs in the World! Pomchis Can Be Active Dogs Who Love to Play With Householders! Are Chihuahua Pomeranians Easy To Train? Vet Bills, Oh Vet Bills! Are these Hybrids a Healthy Breed? How much do Pomchis Cost in the USA? Where Can You Adopt A Pomchi? How long do Pomchis live? Do Pomchis shed a lot? What kind of food do they need? Pomchis are instantly recognizable by their fox-like faces and heart-melting cuteness—which is undoubtedly one of the most enticing features about them. Known for their incredibly small stature, these little pups are fined-boned and oval-shaped, just like their parent breed— the Pomeranian. On average, they stand anywhere between 6 and 9 inches, bearing in mind that males are often slightly larger than females. 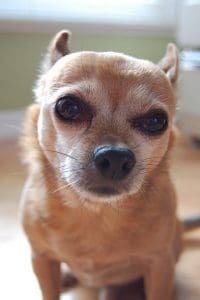 Pomchis tend to attain large, dark round eyes which remain alert and watchful—a characteristic they owe to their Chihuahua ancestry. The ears often stay upright and are almost semi-triangular in shape, while their tail remains semi-curled and puffed! If you’re the kind of person looking for an easy-going dog, one that’s not going to cover your carpets in fur, then the Pomchi may be a great choice for you! This crossbreed are seasonal shedders and will only shed once a year between spring and summer. So, put those vacuums away for the winter! 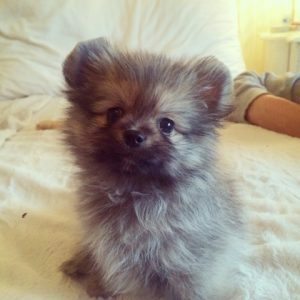 Pomchis tend to inherit their thick double coats from the Pomeranians, which is known for its unwillingness to give up caked-in dirt, mud, and even stool. Hence frequent grooming is a must for sanitary purposes! We strongly recommend that you take your Pomchi in to see a professional groomer every six weeks for those trims. Despite this, Pomchis are quite clean dogs, and will only require bathing once a month, or as needed to keep clean. Now, just like humans, dogs need to have their teeth brushed! Dental disease is a big problem among Chihuahuas. This means that your Pomchi will also be at risk of developing periodontal disease. So be sure to clean your dog’s teeth once each day or at least weekly! A second primary maintenance requirement is regular ear cleanings! Be sure to monitor your dog’s ears for signs of yeast infections or inflammation. We recommend that you check their ears weekly and clean as needed. Often, active working dogs wear down their nails, so since both the Chihuahua and Pomeranian are not a hardworking, energetic dog, they will require regular nail trimming to keep their nails short! This should be performed every 4 to 6 weeks. They may look aloof, but don’t let them fool you! Pomchis are intelligent, notoriously cunning, and yet surprisingly easy to train. According to the American Kennel Club, the Chihuahua is a feisty dog that requires supervision when around other pets and dogs. This holds true for the Pomeranian, too. This means that your Pomchi should never be left alone when in the company of other animals. I think one of the most misleading factors about the Pomchi is their aggression towards young children. There is absolutely nothing to worry about. As with any dog, if a Pomchi is raised alongside, and has learned to socialize with young children, then they will regard them as part of the family. It’s important to remember that when a dog nips or bites, it’s not their fault. Children can be rough with small dogs, and so nips or bites are a warning or defensive action. Since the Pomchi is a sassy little dog, we do not recommend that they are left unsupervised with young children. We highly suggest that these little guys live in homes with older kids who know how to properly pet and play with small dogs. Sassy, cunning, standoffish, but always alert! These are the words that best describe the Pomchi. Around strangers or new faces, they may remain cautious but alert. Now, if you’re looking for a fun-loving dog, like the Golden Retrievers, who might run up to lick people, then the Pomeranian Chihuahua cross might not be the right choice for you. But, if you’re the kind of pet owner, whose first priority is a small, yet protective, watchdog then look no further. Both the Pomeranian and Chihuahua are energetic breeds. So, on average the Pomchi will require a minimum of 30 minutes daily physical activity. Now, people often recommend visits to off-leash dog parks to meet their dog’s physical and social needs. I have to advise against this! Off-leash dog parks contain dogs of all different shapes, sizes, and personalities. Some large dogs may try to engage small dogs and “won’t take no for answer.” This can put your little dog in a dangerous situation. Pomchi puppies are highly energetic pets that have a desire to learn new things and please their owners. Now, some Pomchi pups have become notorious for their stubborn, disobedient attitudes—a trait common to both their parent breeds. Because, even little dogs can be a lot of work, I highly recommend that new dog owners take their puppies to obedience classes to ensure their little pooch remains well-behaved. Are you ready to be won over by the Pomchi? This puptastic video sums up the how smart these dogs are! Heterosis refers to the theory that a mixed breed dog will have fewer health problems compared to their parent breed. So, it is plausible to suggest that the Chihuahua Pomeranian cross is going to be a reasonably healthy dog. Nevertheless, every dog is different— based on their genetics and lineage, some hybrid puppies can be prone to genetic disorders and health problems common to their parent breeds. Read on to know which health problems Pomchi can inherit. Retained testicles and few others. In general, a Pomchi puppy can cost you anywhere between $150 to $950. The average cost of a Pomchi pup is $500, however well-bred puppies can cost roughly $1,400 to $5,500+. In contrast, adopting pets from shelters is another way you can get yourself a hybrid. This will not only give a dog a second chance, but will also make it more affordable, since rescuing from shelters includes vaccinations, microchipping, and spaying or neutering typically. 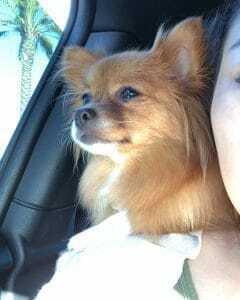 So where do you go to find a Pomchi at a rescue? As they are “new” mixed breed, it may be hard to come by a Pomchi shelter. However, there are many Pomeranian and Chihuahua specific rescues around that may hold Pomchi mixes. Below I have listed some pawsome Pomeranian and Chihuahua rescues you can try in the USA. Getting a new dog is exciting! But, if you’re a new dog owner trying to learn as much as you can about your soon-to-be-pooch, then you’ve probably still got a lot of questions you’d like to ask! Don’t worry! We’ve got you covered! Here are some of the FAQs from people considering adopting or purchasing a Pomchi. Pomeranians can live anywhere from 12 to 16 years, while Chihuahuas can live up to 20 years of age! Hybrids tend to live longer and healthier lives compared to their parent breeds. So a healthy Pomchi could make it all the way to twenty! Unfortunately, both the Chihuahua and Pomeranian are non-hypoallergenic dogs. This means that the Pomchi is not going to be hypoallergenic either! So, we don’t recommend these dogs for people with severe allergies. Both the Chihuahua and Pomeranian are seasonal shedders. This means that their cross will only shed once a year between spring and early summer. As they are little dogs, they will require a diet specific to toy breeds. Dry food designed for toy breeds often contains smaller kibble, making it easier for your pup to enjoy! The good news is, these guys only eat ½ to 1 cup each day! I’ve got a soft spot for the Pomchi because these dogs have such a big personality all wrapped up in a little body! If you’re looking for an easy-going dog that’s playful, smart, and apartment friendly, then the Pomchi is just for you! Do you have a Pomchi? We’d love to see some of the pawesome pictures of your pooch in the comments below! We came upon our little guy at only 2-3 weeks old. His eyes were open. His mother passed and the mother’s owners were faced with bottle feeding 6 puppies. We started with a heating pad in his box and bottle feedings about every four hours for about 4 weeks. He is 1 1/2 years old now and fits the description very well. Our Pedro is the joy of our lives. We have noticed a little separation anxiety so we make sure that who takes care of him when we are gone is very much in his life.